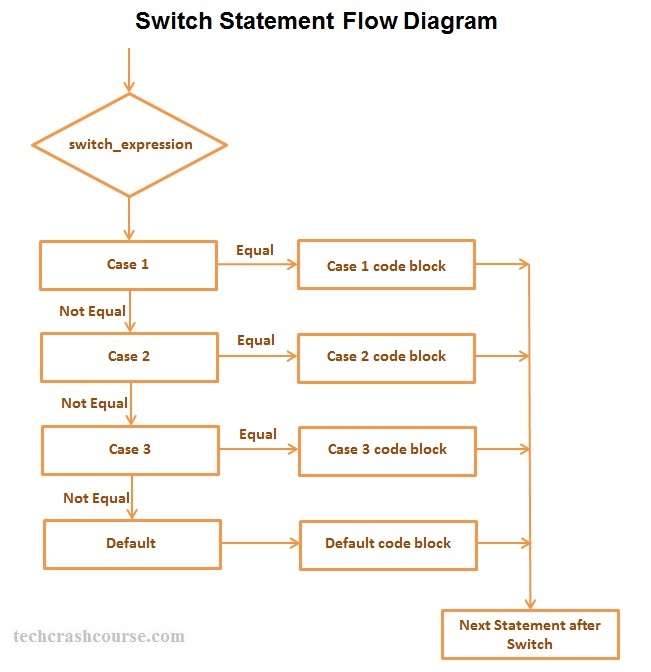 A switch statement allows a variable or value of an expression to be tested for equality against a list of possible case values and when match is found, the block of code associated with that case is executed. Switch case performs equality check of the value of expression/variable against the list of case values. You can use any number of case statements within a switch. The expression value is compared with the constant after case. The data type of the value of expression/variable must be same as the data type of case constants. The break statement is optional.The break statement at the end of each case cause switch statement to exit. If break statement is not used, all statements below that case statement are also executed until it found a break statement. Switch statements can only be used to perform equality comparison, we cannot perform conditional checks using relational operators like >, <, >== etc.